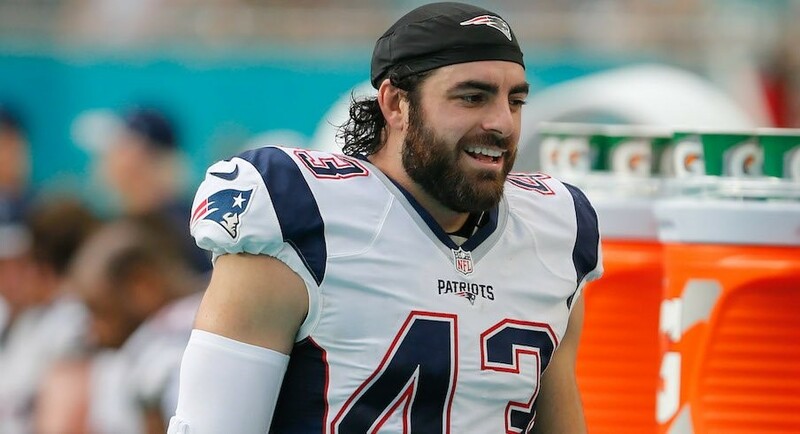 At this point, Nate Ebner should be used to having big plans on the first Sunday in February. For the fourth time in five years, Ebner and the New England Patriots are headed to the Super Bowl, where they will face the Los Angeles Rams in this year’s NFL championship game on Feb. 3 at 6:30 p.m. at Mercedes-Benz Stadium in Atlanta. That hasn’t made it any less special for the former Ohio State defensive back, though, as he prepares to compete for another title. 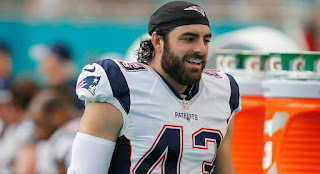 Having previously won Super Bowl rings with the Patriots in 2015 and 2017, Ebner has a chance to become just the second former Ohio State player to win three Super Bowls. Mike Vrabel is the only previous Buckeye who has accomplished that feat, winning a trio of Super Bowls – also with the Patriots – in 2001, 2003 and 2004. The Patriots also went to the Super Bowl last year, but lost to fellow former Ohio State defensive back Malcolm Jenkins and the Philadelphia Eagles, 41-33. Ebner didn’t get to play in that game, because his season ended early due to a torn ACL, so he had added motivation to get another chance to play on the biggest stage this year. “To be able to come right back the following year and have another chance at it, I’m extremely fortunate for that,” Ebner said. When Ebner originally walked on to the Ohio State football team in 2009, no one – not even himself – would have imagined that he would end up playing in multiple Super Bowls. He didn’t even play football in high school or in his first two years as a college student, though he was a standout rugby player, joining the U.S. national team for several international competitions. 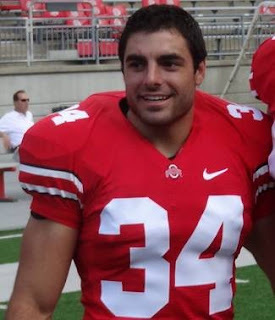 Nate Ebner before his senior season at Ohio State in 2011. Even by the time he completed his three-year Ohio State career in 2011, a lengthy career in the NFL seemed like a long shot. While he did earn a scholarship prior to his senior season at Ohio State, he only saw occasional playing time on defense for the Buckeyes. Nonetheless, Ebner’s special teams prowess was enough for the New England Patriots to select him in the sixth round of the 2012 NFL Draft, and he’s been a staple of the Patriots’ special teams units for the past seven years, leading the team with 329 special teams snaps played this season. He credits the culture of the Ohio State football program, where he played for teams coached by Jim Tressel and Luke Fickell, with effectively preparing him for the challenges he would face in the NFL, setting him up for the success he has since had in the league. Ebner is one of three former Buckeyes – all of whom played together for Tressel in 2009 and 2010 – who will be playing in next weekend’s Super Bowl. John Simon, who was signed by the Patriots in September, and Jake McQuaide, who is in his eighth season as the Rams’ long snapper, are both set to make their first Super Bowl appearances. Ebner says he has enjoyed having another Buckeye in the locker room this season, and says Simon has been a great fit in New England. For Ohio State’s current players who have their own aspirations of playing in the NFL and succeeding at the highest level, there might not be any better example of what perseverance can make possible than Ebner. The Patriots’ honoree this year for the Ed Block Courage Award, Ebner had to overcome personal tragedy – his father was murdered during an attempted robbery in 2008 – along with the long odds of being a walk-on to become a valuable contributor at Ohio State and ultimately establish himself in the league. Ebner’s advice to those current Buckeyes, however, is not to think about what they could eventually achieve in the NFL, but to focus on maximizing their opportunities at Ohio State now. “Don’t think about any of that stuff, ‘cause that stuff’s not what gets you there,” Ebner said. “To me, that was never ... I just worked, that was it. Whatever it was they put me on the field to do, I wanted to be the best that I could at it in the league, and just worked extremely hard to do that. And make the most of the opportunities that come your way.